Should I begin with the story of Howie locking himself in the bathroom today? (for those who don't know, Howie is a cocker spaniel). Actually that is misplaced blame as I did not notice he had curled up in the cool room to sleep and closed the door. When I heard scratching, I discovered the door was locked. How? I think Howie was playing games with me in retaliation for being neglected the past few days. After 30 minutes of attempting to unlock the door and 2 frantic calls to SIL for advice - ( she has grandchild adept at locking situations) After trying 6 different implements, success, hallelujah! and I swear he smirked as he calmly walked out..
Other than that I, have been destroying the downstairs. Every room. I had been anxiously awaiting the photo shoot to be over so that I could purge and pare down even more. I started with the porch. The tables are piled high and bins are full of items to be sold or given away. I love this feeling of examining and assessing. Getting to the basics. Do you even remember what it looked like last year? top will change again once it arrives. Last two days for giveaway. Ends Midnight Monday. My humble thank you for the generous response. at finding these new friends. Sounds like your clever little guy was having some fun with Mommie! Love your beautiful home and good luck with the simplifying. Looks wonderful just as it is to me. Oh that Howie....that little bugger. I'm loving the new look...very sirene. Almost makes me forget it's like a thousand degrees outside those doors. Ahh now I know why you like white so much besides the fact that it's so pretty. Will so go over to Carole's blog. Well I'm glad you and Howie are both safe! He's just so darn cute! So good luck on your simplification project. I have also been trying to limit my stuff to that which is useful or just my favorite things. It feels good to purge some of the excess. Of course, should you feel the need to send any 'white' stuff you don't want my way...I wouldn't refuse! Take care my friend..dont work too hard. How I adore all of the white dishware. Simplicity at it's finest! Everything looks great. It always feels so good to occasionally rearrange and fluff. Keep our favs and get rid of the rest. I need to clean out some closets. What are you doing next week? ;) Glad you got your doggie out of the bathroom. Maybe he needed a little privacy and decided to lock the door. LOL. I am so excited about the ribbon lady starting a blog! So glad Howie is safe and sound on the "other" side of the door! I love your new pared down look, but then I love all of your looks! I can't wait to check out "the ribbon lady's" blog! lookin good! i still have a bit of a mess here....it has to get bad before it gets good. poor howie. he he. sorry for laughing howie. These photos are fantastic. So pretty. I'm so glad the ribbon lady started a blog. I'm headed over to visit. Howie seems to have welcomed the attention he got!! Well, we all love to get fussed over now and then! I'm glad everything turned out all right. Your home is lovely...I can't imagine it cluttered, it looks just perfect! Thanks for the link...I'm off to visit! That Howie...he's a hoot, that's what he is! I am afraid to be really stupid sounding here, but am intrigued as to what exactly the wooden round on the tabletop is? A lid, perhaps? I remember my first communication with you was when I asked how many ironstone pitchers you had. The answer was a lot. Now you simplify. I do get it though. Sometimes I have an urge to just throw everything at our old house away and we might just do it one day. Howie, like a small child created some chaos. Your simplification is just beautiful. I am trying to do the same thing, but it is so hard to get rid of things that I "think" I might use in the future. Any words of advice on how to get rid of stuff that you are questioning? Love your porch Z, can't wait to hear more about the photoshoot! Simplify is exactly what I need to do, I can feel it for some weeks now. If you can do it, then I hope I can do it too, it's not easy for a collecter, right, but I will start it as soon as I'm back from my Summer vacation. So glad to hear that Howie is free again to move about the cabin! I wish you would rub off on me!!!! Too much stuff over here! HI I just started following you, not for the give away but just because I like your blog and style. I am Riet and I live in Holland. I saw your name in June's blog. 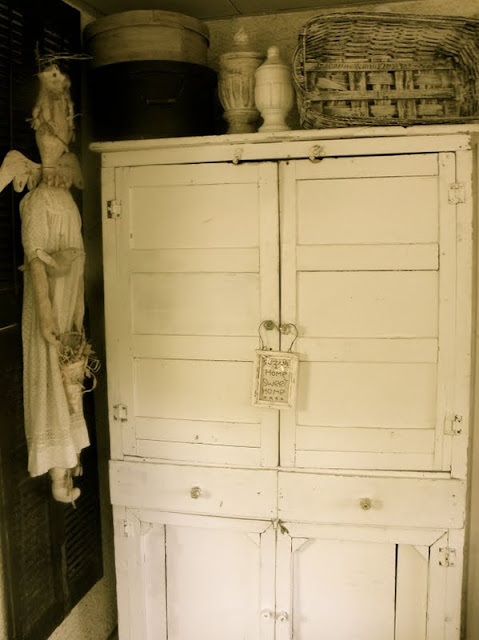 I do love your cupboards and am intrigued by the angel on the wall. Is it of your making? One can never tell what mischief a pet can get into can they. I'm with you on the down sizing thingy! Finally got my kitchen/sunroom painted yesterday. But, guess what? Gotta paint it again! Not sure what is going on with the paint, bought two gallons and they are different colors! I could have cried, well I think I did! 14 x 40 room! I was so happy to have it done till I started noticing some differences where my daughter cut in! Low and behold, 2 different colors! Not sure if Lowes will do anything about it or not! Still doesn't compensate for my time! Oh well it's gonna be another long day here! If I hadn;t seen your home in person, I would swear you adjust your camera to sepia tone. It all looks fabulous. No wonder a magazine was there to film it. Love the room with a little less, although it is all so interesting! Hope you are good girl! I am glad Howie is safe! Our animals really do run our lives! I LOVE your home! so serene and beautiful. You are a very talented decorator and designer. We received 2" of rain! woo hoo! Simply beautiful and such serenity.